Zucchini and/or green chile make a great summer side dish when you slice them into bite size strips to resemble french fries. 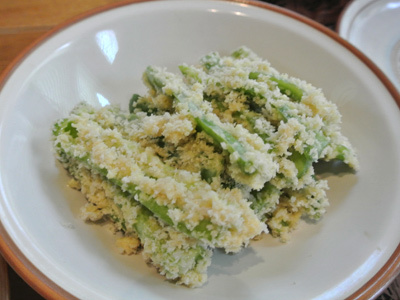 Dipped in a buttermilk batter and rolled in panko bread crumbs give them a crispy outer texture that tastes so good. French fries and ketchup may go hand in hand, however zucchini and chile fries taste especially good dipped in salsa or green chile dip. You can’t go wrong there. Imagine these fries alongside a big juicy burger or a grilled chicken sandwich. I can assure you they truly taste scrumptious together! For the batter you’ll need eggs, flour, buttermilk, salt, white pepper, cayenne pepper, garlic powder and Tabasco sauce. 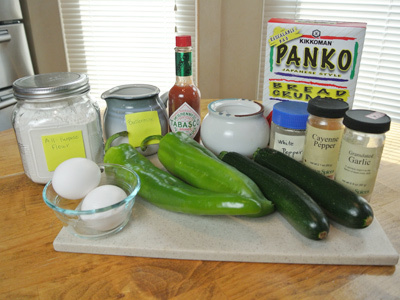 The batter will make enough for 2 small zucchini and 2 Anaheim chiles. You’ll need approximately 3 -4 cups of Panko bread crumbs. 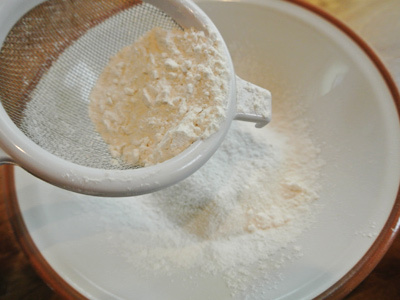 Sift 1/2 cup flour into a medium bowl. Add salt, white pepper, cayenne and garlic powder. Mix together. 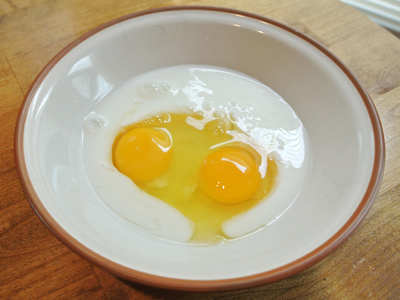 In another bowl whisk together buttermilk and eggs together. 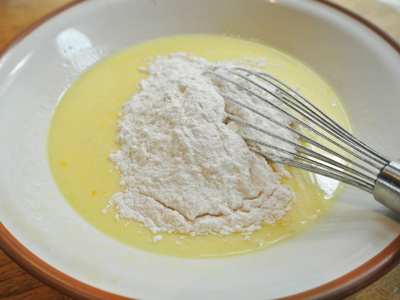 Whisk in the flour to form a batter. Add a few shakes of Tabasco sauce just for good measure. Set aside. 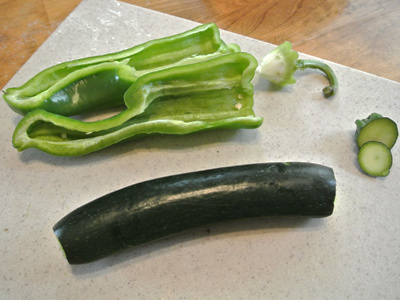 Cut the ends of a zucchini and stem and seed the Anaheim chile. Cut both in half, then slice strips about 1/2 inch thick. I started with the zucchini. 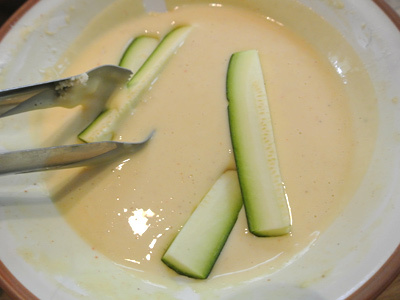 Dip the zucchini slices into the batter making sure to coat all sides. 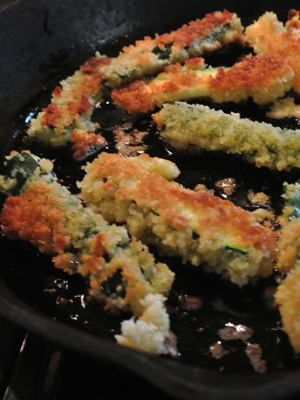 Roll the battered zucchini into the panko bread crumbs. 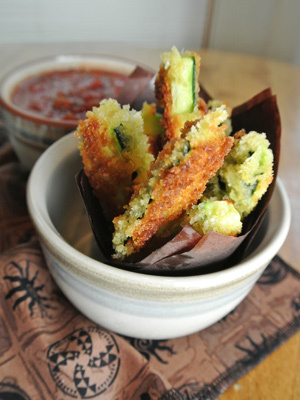 Set aside in a bowl while you prepare the rest of the zucchini and chile strips. The zucchini . . .
and the chile strips . . . Heat a skillet with just enough olive oil to coat the bottom of the pan. Add as many strips as you can in the skillet. Let them brown for 2 – 3 minutes. Then turn them over to brown another 2 – 3 minutes. Set them aside on a warming plate. Use a slotted spoon to remove any remaining crumbs in the pan, then coat the pan with another layer of olive oil. Once heated, add the next batch of zucchini or chile strips to cook. Continue browning in batches until all strips have been fried. These are the Anaheim chile strips. 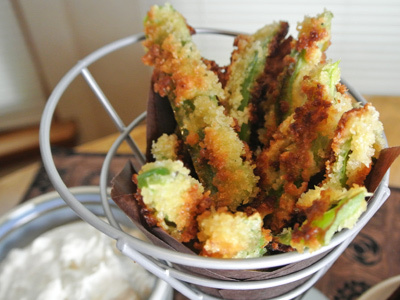 A serving of chile fries with green chile dip anyone? 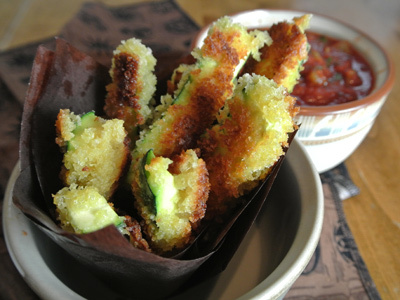 Or maybe you prefer zucchini fries with salsa! 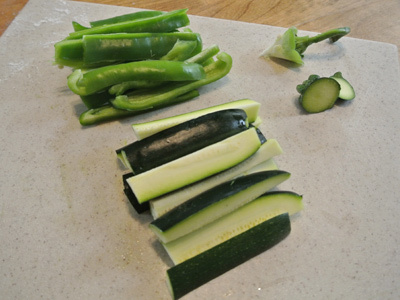 Cut the ends off of zucchini. Stem and seed chiles. Cut in two and make strips about 1/2 inch thick. 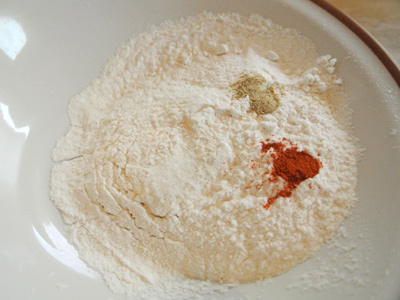 Combine flour with salt, white pepper, cayenne and garlic powder in a medium bowl. In another bowl whisk together the eggs and buttermilk. 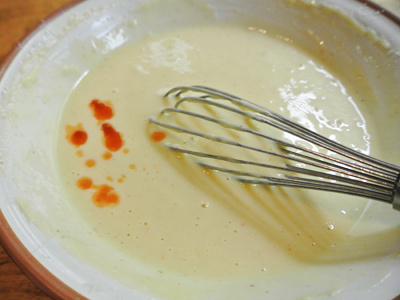 Whisk in the flour to make a batter, then add Tabasco sauce. 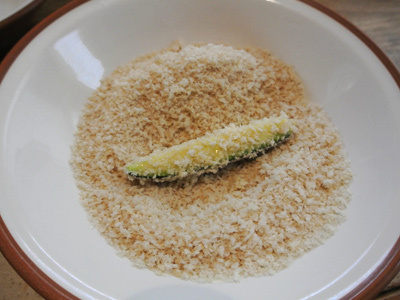 Fill another bowl with panko bread crumbs. Heat a skillet over medium high heat. Add just enough olive oil to coat the bottom of the pan. 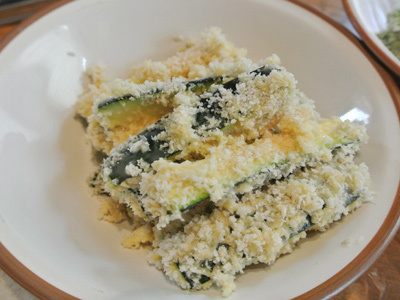 Dip each zucchini or chile strip in the batter, then roll in panko crumbs. Set aside until all strips have been battered and rolled. 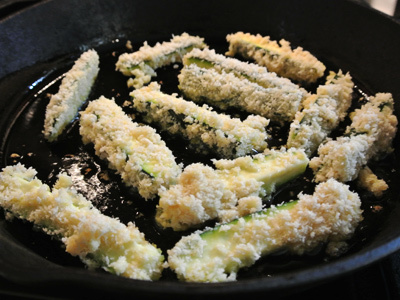 Fry a layer of zucchini or chiles for 2 – 3 minutes on each side. 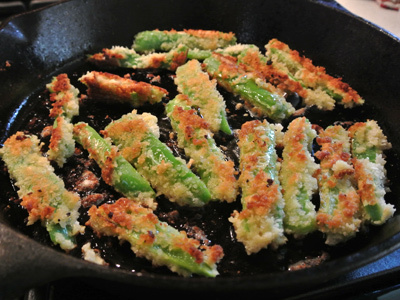 They should fry up crisp and brown, leaving the zucchini and chiles tender inside. Remove to a plate lined with paper towels to soak up any excess oil. Between batches remove crumbs from the skillet with a slotted spoon. Add enough olive oil to coat the pan and fry the next batch. Serve hot. Dip fries in salsa or green chile dip. Combine all ingredients together in a bowl. Refrigerate up to 1 week.